Home » Family Matters » Parenting » Pursuing Parenthood: This is Your Chance! I have had the honor in my life to achieve many things, win many battles and succeed in many areas of life. Out of all of them, my greatest success was as a parent. Being a mother is the biggest achievement in my life. I get to remind myself this every birthday in our family, every Mother’s Day, every Father’s Day and every time my children succeed at something. I have learned the hard way not take this for granted. When I lost two children, I learned that having children was a gift and that I needed to cherish this gift every day of my life. When it happened, I had a 5-year-old daughter and I realized that life was short and that it was better to enjoy every second of it. In my darkest hours, I reminded myself of people who were living without a child – people who were single, afraid of having a child on their own, women who were running out of time or experienced a miscarriage, were sad and could not move on. I reminded myself that I was lucky to be a mother. Not all of my parenting was easy and smooth, but it was worth every second of the heartache. It was so worth it that I have dedicated my work to helping parents find joy in their parenting. This blog is full of information for parents to be the best parents they can, to raise the best children they can and to carve their parenting moments on their hearts, while they practice Pride Therapy. After I lost my two children, I had a talk with a good friend Kathy, who had made the decision to have only one child. She was an only child, so she made the choice to raise one child. We used to walk together for an hour and a half 3 times a week. On one of our walks, I told her that I wished I could be like her. I wished I could decide to be a mother of one child and be at peace with it. I was not. I contemplated the idea and it just did not work for me. I had to have another child. I think I was obsessed about it. I had to lift myself up and try again and again and I did it! Without the right mindset, I would have given up, especially after the second loss, but I kept on trying. There are many men and women around the world who struggle to become parents. Some of them think that maybe it is a sign they are not supposed to be parents. I usually tell them that maybe it is a sign they have to have their children in a different way. My loss taught me the best lessons in life. Maybe the sign is that we need to learn something from our struggles. Grow from them. While in the past, you could be a parent only through pregnancy, today, the options are greater: hormone adjustments, IVF, sperm donation, egg donation, adoption, surrogacy, fostering and more. If you are considering creating a family and things are hard, do not be discouraged. One in six pregnancies is assisted. All five of my pregnancies were assisted. Without this assistance, I could not have children. The challenge is to keep the hope and the joy of life when things do not happen exactly as you expect them to. I had the honor of working with some clients who, for many different reasons, did not think they could ever be parents, although their heart was aching for a child. Most of them were stuck on the traditional ways of having children or thought their body had betrayed them. They did not consider how their emotional health was affecting their ability to get pregnant. Changing their mindset helped them search for new ways to achieve their desired goal of being parents. Now, when they have children of their own, they cannot imagine themselves without them. Recently, I joined a group of experts that share their ideas and philosophies about parenthood in a worldwide summit, called Pursuing Parenthood. 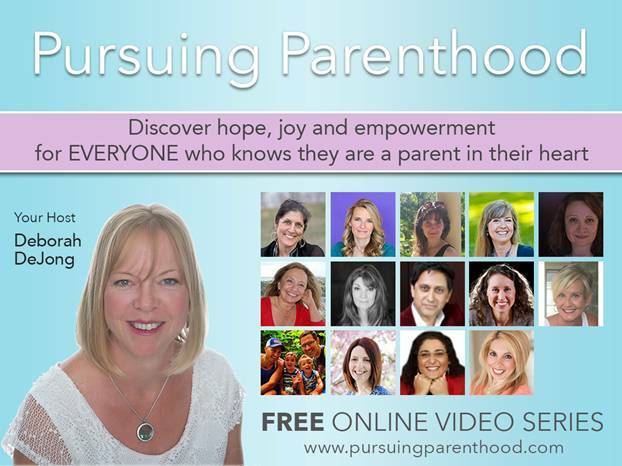 Through this online video series, you can discover hope, joy and empowerment on your path to parenthood. It is also good for those who will only be parents later on in life. In this summit, hosted by a colleague of mine, Deborah DeJong, 25 incredible experts educate, inspire and share insightful tips and strategies to put you on the path to parenthood. They share valuable information on fertility, infertility, surrogacy, adoption, fostering, women’s health, nutrition, stress, health and wellness, self-love, relationships and empowerment. All the experts share powerful stories, tools and strategies to help people become parents. This is a free event with inspiring people and I am honored to be one of them. The summit starts on 25 September 2017 (in 5 days) and you can watch it for free. All you have to do is register. Pursuing Parenthood is made for anyone who wants to be a parent and may be struggling at the moment. It is there to remind you there is light at the end of the tunnel. Parenting has been an amazing journey for me and for many of my clients, who have gone through the dark moments until they became parents. We can tell you that every second of the heartache is worth it. Join us if you want to be inspired.